After saying no, no, no time and again, I have given in. I finally own an electronic book reader, or e-book reader, as it’s called, or even just e-reader. Those are new words to be included in any good dictionary. They deserve to be. The e-book reader is such a ground-breaking and popular device. Most of you know what an e-reader is, I’m sure. You may own one. If you/re drawing a blank, an e-reader permits you to read electronic, meaning digital, books—books coming to you by computer. Not only e-books. Also electronic versions of magazines and newspapers. In fact, you are reading this on an electronic newspaper. An e-newspaper! How I got an e-reader beautifully with a big bow on it under the Christmas tree is a long story. I’ll just give you the short version. In early December, as usual, my daughter Monique asked me to make a Santa’s list for her. I have never, never done that for anybody. My attitude has always been, Let Santa decide if I’ve been a good boy. If yes, he can bring down the chimney anything for me that he chooses to and I’ll say a sincere thank you. I prepared a short list suitably mixed. I need very little, lucky me.But I put down small things and bigger ones. You understand, I’m sure. The biggest was an e-book reader. For the record, I’ll tell you that I have never read an e-book in my life. I have never felt an urge or a need to read one. I’m perfectly happy with old-fashioned print books. I’m amazed to use that adjective here, “old-fashioned.” But I recognize that millions of people are reading e-books. And thousands of books are being published as e-books as well. It’s an avalanche. It does look as if print books are on the way out. I hope not. I love print books. Paper books! I have read hundreds…perhaps thousands….of them. I have books all through my home. By my desk. By my bed. By my favorite chair. On shelves big and small. On the floor. I’m continually moving books in and moving books out. I cannot live without books. I don’t want to live without books. One of the great tragedies for me would be going blind. So why did I put an e-reader on my list? Glad you’re wondering. I have friends who love books as much as I do who have bought one, and love it. That has impressed me. At airports and other places where you have to wait, and on planes and trains and long-distance buses, I see more and more people using them. They make sense. E-readers are small devices…you can tuck one in your pocket. yet you can stock them with thousands of titles. Which is kind of crazy, well, to my thinking. How many can you get around to reading? And as mentioned, also magazines and newspapers and computer docs, your own and from others. You can make notes on whatever you read! You can quickly look up things through the magic of a computer’s Find function. And I had a more practical reason. I am the author of three books. And at this very moment they are bing converted into e-books! Some people like e-books so much that they buy only e-books. It’s true. Like every author, I write books because I hope they will be read. That’s the whole point. So I felt that I had to join the growing crowd. From now I will be the author of books and e-books! I have come to realize that e-books have distinct advantages. You can make the type bigger or smaller, as you please…can change even the font. They cost less. Many e-books are free—and this will lead me to tell you about an enormously important man in a few minutes. I didn’t even know his name. I’ll bet you never heard of him either. But I had another reason to want an e-reader.. A terrific reason. All my books have many photos. My Around the World book has scores of them. My Around Asia book more than300. My latest, my Peace Corps book, has more than 140. Know what? They look sharper, better in my e-book versions than my print books. I used to think that it would be uncomfortable, even impossible, to read a book on a screen, which is what an e-book has. I can’t use that argument any more. Why? Every day I read newspapers online. Magazine pieces, too. I look up articles in digital encyclopedias, wikipedia being one. Every day I look up something on Google or Bing or Yahoo, and they lead me to an incredible variety of websites. .Reading all this is not a problem. It’s so easy. Saves so much time. My eyes don’t seem to mind. In fact, it’s wonderful. I love it. I have friends of my age or nearly my age who refuse to learn how to use a computer. They’re intimidated by it. What an awful mistake not to give it a try. Well, my opinion. . I plead with then, cajole them. “It’s not that hard. You can do it. It will change your life.” I mean every word. Bottom line, I asked Santa for an e-book because I had to get with it! And I got one. It turned out to be one of the new Kindle Fires. The Fire is more than an e-reader. It’s a digital “tablet.” And that’s a word that must be added to the dictionary, too–well, that new meaning of tablet. A tablet is a super e-book. For some people it’s a full, powerful computer. Can do much more than an e-reader…bring you movies…music…photos…permit you to surf the web and send and receive email…type on it quite easily…do other amazing things. The supreme example of a tablet so far is the Apple iPad. But the iPad is a big thing. No way can you tuck it in your pocket. You can a Fire. It doesn’t do everything the iPad does, but it’s the closest thing to it. And it’s half the price, even less than half for some models of the iPad. I was delighted with my Fire. But …. I realized I would never use some of those fantastic features. So again an exchange. Poor Monique! What I now have is a Kindle Touch. It’s called that because you do just about everything on it with just a touch of your finger. I’m experimenting with it and I must say I like it. It’s only fair to mention there are a plethora of e-readers on the market, with more coming. And “smart” phones can also read e-books. But I can’t ever see myself doing serious reading on a tiny phone! So I have joined the e-reader enthusiasts. It’s a new adventure. How nice when you’ve gotten into thinking that your adventures are all over. Now an incredible, astounding coincidence. Just as I was unwrapping this beautiful gift, so to speak, I heard of the death of a man who has had an enormous impact on me—on millions of people like me….a man I had never heard of and whose name, if ever I got to hear it, would have meant nothing. That man is Michael Hart, age 64, of Urbana, Ill. He is the man who invented the e-book! Notice, please, that I said the e-book and not the e-reader. Until quite recently, until the e-reader, you read e-books on your computer monitor. Not difficult. 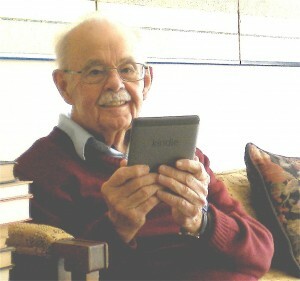 Michael Hart devoted his life to making the e-book the the technical and marketing sensation that it is.. More than that, he envisaged his invention of the e-book as something that would better serve anybody who likes to read, anywhere in the world that has computer service…potentially all of humanity. It was his ambition to make books so available and so cheap that anybody could afford them.To make then free, if possible! Here is what Wikipedia has written about him, as it wrote it. I also gleaned some from other online sources in the public domain. Michael Hart’s father was an accountant, and his mother, a former cryptanalyst during World War II, was a business manager at a retail store. In 1958 his family relocated to Urbana, Illinois, and his father and mother became college professors in Shakespearean studies and mathematics education, respectively. Hart attended the University of Illinois, graduating in just two years. He then attended but did not complete graduate school. He was also, briefly, a street musician. During Hart’s time there, the University of Illinois computer center gave Hart a user’s account on its computer system: Hart’s brother’s best friend was the mainframe operator. Although the focus of computer use there tended to be data processing, Hart was aware that it was connected to a network (part of what would become the Internet) and chose to use his computer time for information distribution. Hart related that after his account was created on July 4, 1971, he had been trying to think of what to do with it and had seized upon a copy of the United States Declaration of Independence, which he had been given at a grocery store on his way home from watching fireworks that evening. He typed the text into the computer but was told that it would be unacceptable to transmit it to numerous people at once via e-mail. It might crash the system. To avoid that, he made the text available for people to download instead. This was the beginning of what is now known world-wide as Project Gutenberg. Hart began posting text copies of such classics as the Bible and the works of Homer, Shakespeare, and Mark Twain. As of 1987 he had typed in a total of 313 books in this fashion. Then, through being involved in the University of Illinois PC User Group and with assistance from Mark Zinzow, a programmer at the school, Hart was able to recruit volunteers and set up an infrastructure of mirror sites and mailing lists for the project. With this the project was able to grow much more rapidly. Hart was an author and his works are available free of charge on the Project Gutenberg server. He supported himself by doing odd jobs and used an unpaid appointment at Illinois Benedictine College to solicit donations for the project. He said, “I know that sounds odd to most people, but I just never bought into the money system all that much. I never spent it when I got it. It’s all a matter of perspective”. Hart glided through life with many possessions and friends, but very few expenses. He used home remedies rather than seeing doctors, fixed his own house and car. He built many computers, stereos, and other gear, often from discarded components sacrificing personal luxury to fight for literacy, and for preservation of public domain rights and resources, towards the greater good. The man who spent a lifetime digitizing literature lived amidst the hard copies in his house in Urbana stacked, floor to eye-height, with pillars of books. He led a life of near poverty, and “basically lived off of cans of beans.” He cobbled together a living with the money he earned as an adjunct professor and with grants and donations to Project Gutenberg. Now volunteers around the world digitize books for Project Gutenberg in their spare time. Some digitize many. That is how the inventory of free e-books is steadily being expanded. Now why is it called Project Gutenberg? 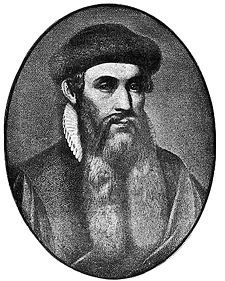 Johannes Gutenberg, as we learned in school, invented moveable type—one of the world’s most important inventions. Before that, documents and books were printed from hand-carved woodblocks. Yes, with the letters carved in relief on wood so they would stand out. Johannes Gutenberg 1398 – 1468 His technological break-through radically changed the world ... the way Michael Hart’s is. Imagine the labor of doing that. Ink was applied to the surface of the letters and words, and these were impressed onto sheets of paper. What he did was make individual letters and numbers, and these could be assembled into words and sentences and paragraphs. Then broken apart and, re-used to form new words and sentences.. A new technology which transformed not only printing, but society. So, with more things being published, more people were encouraged to learn to read. His technique was adopted everywhere. And with more people reading, more things were published. It was explosive. Reading had been an exclusive skill reserved for very few. Now reading was a skill available to anybody interested in putting in the time to learn it..
His first efforts were crude but got better. He became so adept that he printed the massive Gutenberg Bible, a crowning achievement not only of great skill but great beauty. Gutenberg was a blacksmith, goldsmith, printer and publisher. The key year was 1439. It has been said that he started the Printing Revolution, the event which ushered in the modern period. It played a key role in the development of the Renaissance, Reformation, the Age of Enlightenment and the Scientific Revolution and laid the material basis for the modern knowledge-based economy and the spread of learning to the masses. He was the first European to print successfully, on a commercial basis, and was the first to print a book outside the Orient. Gutenberg’s printing technology spread rapidly throughout Europe, and of course was refined and perfected by others. The process quickly replaced most of the manuscript methods of book-production throughout the world. You see why Johannes Gutenberg was such a great man. I believe that Michael Hart’s invention of the electronic book reader is an equally great invention. It will usher in a new age. Transform the world. He deserves to be as famous. There should be statues of him. He is the Gutenberg of our epoch. My print books are the results of Gutenberg’s genius. My e-books the results of Michael Hart’s. How fortunate am I as the author of both types. How fortunate are all of us who read books.